Remodelaholic | DIY Large Rustic Wood Star with Lights For Under $5! For Project #2 of our 12 Projects of Christmas, we have a cheap, high impact holiday decoration you’re going to love — a HUGE rustic wood star, lights and all, and you can make it for just a few bucks! Wahoo! Hey Remodelaholic readers! It’s Thalita here once again from The Learner Observer and I am all about Holiday Spirit these days. Who’s with me? Holiday decor can get tricky, and truthfully, sometimes you picture something in your mind and just can’t find it anywhere at a store without spending a fortune, or it just actually doesn’t exist! Though this doesn’t always work or pay off, making it yourself can be the perfect solution. I wanted a super tall rustic wood star to have as a minimal, non-tree piece of holiday decor, and could not find one anywhere, or they cost far too much! One night, while hanging out at the hardware store, as one does often (ha! ), I found the solution to my problem: nailing strips! a 100-light string of lights (which I already had so it cost nothing, but if you did purchase some, you’re still under $10 for the star, or $5 if you can catch the lights at a good price!) You can shop around here on Amazon to score a good deal, or use a coupon at your local Joann’s or Michael’s store for a deal, too! To start, lay out your star shape on the floor and make sure everything lines up. Next, start by nailing the 5 star tips, making sure not to move anything out of place as you do so. I’m making it sound way harder than it actually is, I promise. Now you can go ahead and add some nails to the other spots where the wood meets, otherwise you end up with some significant gaps – nailing strips are rarely ever perfectly straight! Now you’re ready to add in some twinkle and sparkle! Grab a string of mini-lights and loosely place around the outside of the star shape. Don’t worry about having a bit leftover at the end. I found that I liked the lights sort of pooled on the floor a little it anyway, and we’re never looking for perfection when it comes to things like this, am I right? Just like that, you have a large, impactful, but very minimal (and inexpensive) piece of holiday decor! This was a great option for us to use in a family room since the actual tree is at the front of the house by a window. This way we still get to inject some holiday spirit throughout the house without needing to get too fancy or elaborate! This project honestly took about 10 minutes to make and cost $3 in nailing strips! You can also definitely make them smaller and have several different sizes, which I’m tempted to do for front porch decor! So what do you think? Is this easy enough for you to try this holiday season? 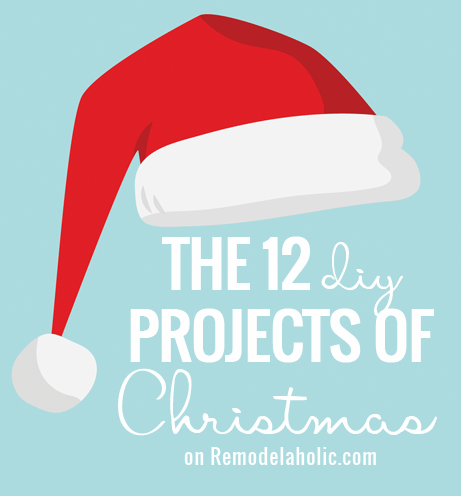 Click here to see our other 12 Projects of Christmas — decor, gift ideas, and more! I think this will be made as I already have the lights and ANY excuse to go to Home Depot is fine with me. Right after I finish building the fireplace repurposing a king size white fireplace worthy bed frame. I love to craft. we always had a huge star on top of the barn my dad built. I tink my Florida sister claimed it when we cleaned out the property when mama passed. Darn her anyway. Both sister but especially mom. This will be as loved and mean home as that one did. driving over the river and through the woods for real you could see that star like a beacon calling us home for 30 years. Thank you.